Carolina Energy Conservation provides air sealing and testing services all throughout the state. As one part our Home Energy Audit, we will help you determine the best ways to save energy by sealing air leaks that exist in your ducts, around windows and doors, in walls and attic floors, and elsewhere in the home. Doing so will save lost energy and dollars year round. Moreover, your home will now be more comfortable. With our air sealing service, rooms that overheat in the summer because of hot air infiltration will become cool, and rooms that are cool and drafty in the winter because of cold air infiltration will become warm. Heat can find its way out of the home through a wide variety of gaps, cracks, and holes in all parts of the house. With our blower door test and home energy audit, we can quantify how much air is leaking out of your house and pinpoint the leaks. From the attic to the basement, Carolina Energy Conservation can locate and seal air leaks all throughout the home. If you're interested in having us diagnose your home with our comprehensive Home Energy Audit and seal air leaks to improve home comfort, call or e-mail us today! We proudly offer our services all throughout South Carolina & North Carolina, including: Myrtle Beach, Charleston, Sumter, Bluffton, Florence, Mount Pleasant, North Charleston, Darlington, Beaufort, Goose Creek, Blythewood, Summervile, Pawleys Island, Lancaster, Conway, Orangeburg, Hilton Head Island and more! Air sealing should always be done before insulation is installed! Carolina Energy Conservation provides both air sealing and insulation services. No more leaks! - For many air sealing tasks, Carolina Energy Conservation recommends two-part foam. The mixture leaves the nozzle in liquid form but expands rapidly to fill and adhere inside cracks and gaps. As it cures, the foam will create a barrier that is both airtight and functional as insulation. Most homeowners are excited to see how much energy they'll be saving after they've had their home air sealed. With Carolina Energy Conservation, you won't need to wait to see the difference in energy efficiency in your home. Carolina Energy Conservation technicians can perform a second blower door test when the air sealing work is done. The lower leakage rating confirms that you have a more airtight home, with enhanced energy performance, greater comfort, and lasting savings on your heating and cooling bills. Don't let anymore of your conditioned air escape from your home! Call 1-855-410-0662 or contact us online to schedule a free inspection of home insulation and an air sealing quote. We also offer a comprehensive home energy audit. 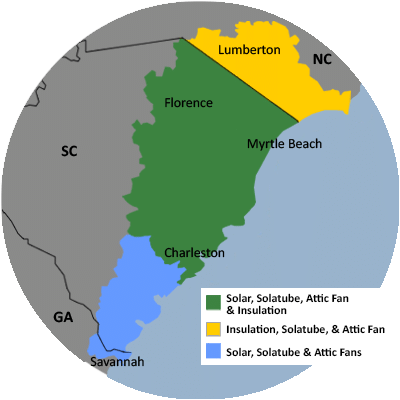 We are your trusted air sealing contractor serving Charleston, Myrtle Beach, Sumter, Florence, Bluffton, North Charleston, Mount Pleasant, Beaufort, Goose Creek, Darlington, Summervile, Blythewood, Lancaster, Pawleys Island, Orangeburg, Hilton Head Island, Conway and the surrounding areas!